Nestlé, the world’s largest food company, has broken a pledge to end the use of vanilla flavourings in baby milk powders, according to a report. Nestlé did remove sucrose flavourings, but continued to manufacture infant formulas with vanillin, telling CMF that it would “communicate timelines [for a phaseout] as soon as we have a technical solution”. In its emails, Nestlé emphasised that it had applied the World Health Organization instructions “as implemented by governments”, adding that the Hong Kong code was “stricter than our own policy”. 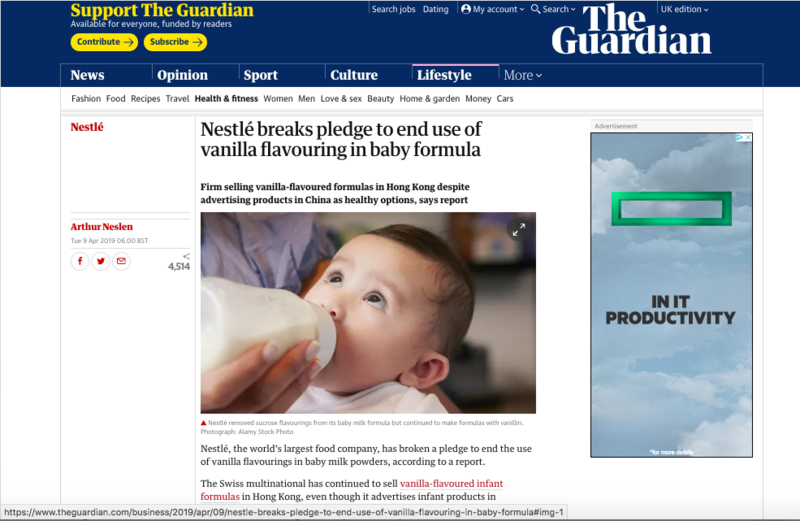 Nestlé has also continued to promote its Illuma infant formula in Hong Kong as “ever closer to lactating secretion”, despite WHO guidance prohibiting promotions suggesting equivalence with breastmilk. from the few recipes that still contain [them]. We are in the process of finding alternatives. We are also removing vanillin claims in new labels.